“You left us in this way, and died in front of me. I couldn’t do anything, father, to assist you”. 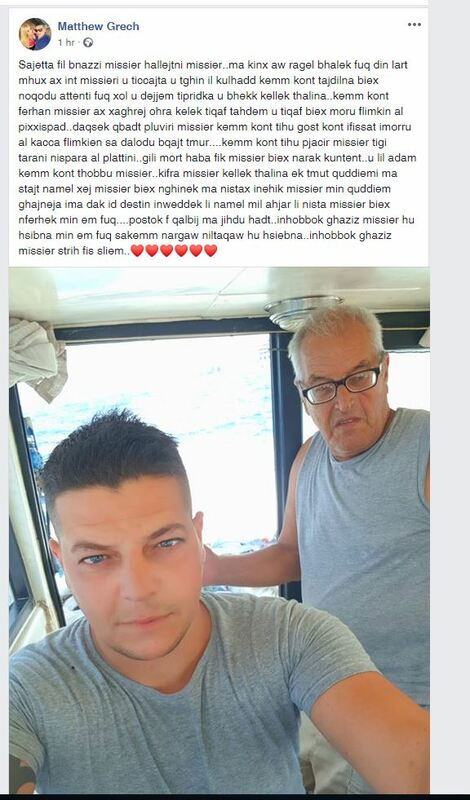 These are the word of the son of the man who died tragically this morning at Ħamrun. The victim’s son, Matthew expressed on Facebook his sorrow and pain for the death of his father. Matthew described his father as a unique person, always joking and ready to help everyone. He stated that his father used to warn them to be careful at work and, unfortunately, his father died in this way. Emanuel Grech was about to stop working in two months time. His son said that they had longed for this moment so that they will go fishing and hunting together. Matthew wrote “I promise you that I will do my best to make you happy up there; no one will take over your place in my heart”. Emanuel Grech died when he fell two storeys height into a lift shaft at a Ħamrun shopping complex. The victim was assisting his son and fell into the shaft while he was carrying some things. He ended up two-storeys down at the complex parking area.